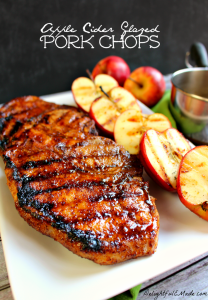 These Apple Cider Glazed Pork Chops are AMAZING! Perfectly seasoned, juicy, delicious and ready in under 30 minutes! In a small saucepan, prepare the glaze by combining the Red Barn Apple Juice, maple syrup, Dijon mustard, crushed red pepper flakes, and salt. Bring to a simmer. While the cider comes to a simmer, prepare the pork rub. In a small bowl combine the brown sugar, chili powder, garlic powder, salt and pepper. Mix thoroughly with a fork. Add the oil to the spice mixture. It will be the consistency of a crumbly paste. Pat the pork chops dry with paper towels, and then cover the chops on all sides with the spice rub.